The reduced channel capacity of a cochlear implant necessitates that sound information be efficiently encoded for maximum transmission. With one of the bottlenecks being the capacity of the neural coding, a novel coding strategy based on a model of the excitability state of the target neural population was developed. The algorithm estimates the refractory behavior of the stimulated neural populations to compute the excitability state after the presentation of each stimulus, and uses this excitability state in the selection of the next stimulus. The Excitability Controlled Coding (ECC) strategy’s algorithm was implemented as a Matlab Simulink xPC model, and executed in real-time on a Speedgoat (hardware) system with analog (microphone) input. The output is configured for real-time streaming to Nucleus implants using a Cochlear StimGen RF encoder hardware. ECC was then compared against an ACE implementation on the same hardware system using a spectral ripple test as well as adaptive sentences (OLSA) in noise. Assessments were made by 4 experienced adult CI listeners. Initial testing comparing ACE vs ECC shows marginal improvements with ECC for the spectral ripple test as well as for OLSA sentences in noise. However, these may not be the optimal tests for determining the advantages of ECC and further considerations are needed. ECC is a coding strategy for cochlear implants that attempts to account for the capacity of the neural interface in transmitting encoded information. Initial results are promising, showing marginal improvements over the current ACE strategy even without much optimization and training. 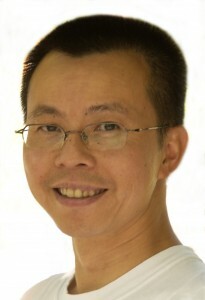 Waikong Lai, PhD, is a senior research scientist at the Sydney Cochlear Implant Centre (SCIC) which is part of the Royal Institute for Deaf and Blind Children (RIDBC). Dr Lai’s extensive experience stems from his previous roles in research and engineering at the CSIRO department of Applied Physics (B.Elec.Eng. ), Monash University (M.Eng.Sci. ), University of Melbourne (Ph.D) and Zurich University Hospital (Postdoc Research Fellow). Some of these include the development of the NRT Nucleus Response Telemetry system and software now used routinely on a clinical basis for cochlear implant fitting and management, research and development of novel bio-inspired signal coding strategies, as well as development and management of the Swiss Cochlear Implant database.